Thirteen teens from six states attended POE 2016 in Salt Lake City. Pipe organ encounters are the most successful outreach programs sponsored by the American Guild of Organists (AGO). 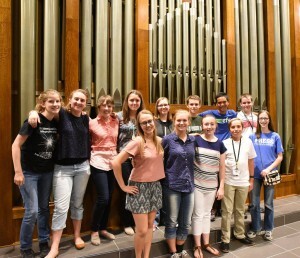 POEs offer teenagers a rewarding opportunity to learn more about the pipe organ and its construction, instruction with experienced teachers and performers, visits to hear and play outstanding instruments, and the chance to meet and interact with peers who share an interest in the King of Instruments. 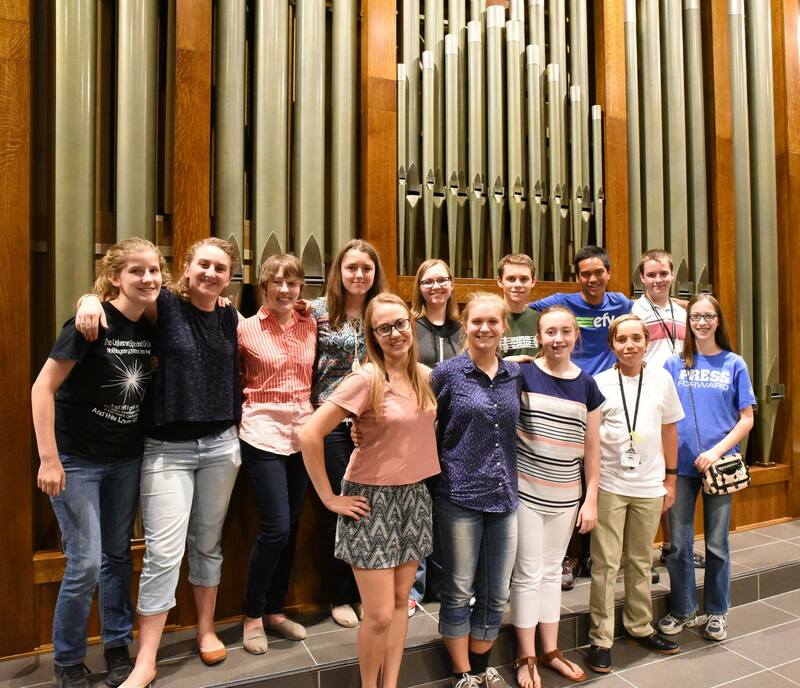 The Utah Valley Chapter held its very first Pipe Organ Encounter on July 25-30, 2016, on the campus of the University of Utah, which was central to the location of many fine organs in the Salt Lake City area. There were thirteen students in attendance with a variety of playing levels; some had limited organ experience, while others had previous private lessons. The students were from Utah, Alaska, Colorado, South Carolina, Arizona, and California. Our guest faculty included Leslie Robb from San Diego, California; Dr. Don Cook, organ area coordinator and university carillonneur at Brigham Young University; Dr. Brian Mathias, organ instructor at Brigham Young University; Dr. Clay Christiansen, Tabernacle Organist; Dr. Lynn Thomas, director of organ studies at Utah State University; Heidi Alley, organist at St. Paul’s Episcopal Church; Chris Huntzinger, organist at St. Ambrose Catholic Church; and Sheri Peterson, dean of the Utah Valley AGO. The students had a private lesson each day, Tuesday through Friday. They had the opportunity to receive these lessons on a variety of instruments. The chapter had volunteers drive the students to each of the lessons and monitor the lessons. On Tuesday the students enjoyed a tour of the organs on Temple Square, including the Conference Center, Assembly Hall, and Tabernacle, hosted by Bill Hesterman of Rocky Mountain Organ Company and Robert Poll, Temple Square Organ Technician. The students then attended a noon recital by Dr. Clay Christiansen at the Tabernacle. That evening the instructors and organists from the chapters performed a mini recital and hymn-sing for the students at St. Ambrose Catholic Church. The students also participated in a liturgy class later that evening, offered by Chris Huntzinger. On Wednesday the students toured the Bigelow & Company Organ Builders facility in American Fork. In the afternoon, the students toured the organs at Brigham Young University. At BYU the students had the opportunity to play in a master class hosted by Dr. Don Cook. Afterward, a dinner was provided on the lawn while everyone listened to a recital performed on the BYU Centennial Carillon. One of the highlights of the week for the students was having open console time on the carillon after the recital. All of the students took turns climbing up the steps into the tower to play and “experiment” on this fantastic instrument. To end the evening, everyone walked to the BYU Creamery to enjoy some ice cream. On Thursday the students participated in a master class with Dr. Clay Christiansen and heard a recital by Dr. Richard Elliot in the Tabernacle. Later, the kids attended a basic registration class on the organ in the Libby Gardner Hall at the University of Utah, followed by open console time. That evening the students were able to change gears with some free time and put on a variety show to showcase a talent (other than organ or piano) for their peers. They had a blast with the show! That night they received a special tour of the Cathedral of the Madeleine Eccles Memorial Organ, another highlight of the week. Friday afternoon the students relished a recital by Tyler Boehmer, regional winner of the 2015 Quimby Scholarship Competition, at First Methodist Church. They loved hearing and seeing an organist perform who was closer to their own age. Later, at the Cathedral Church of St. Mark, the students played a game of organ Jeopardy, while they took turns setting up the organ for the student recital that night, where the students showcased their week’s hard work. They performed a fantastic recital for their peers, family, and friends. To conclude the week, the instructors held an awards ceremony for the students on Saturday morning to recognize their accomplishments of the week’s hard work. The students who attended POE 2016 thoroughly enjoyed interacting with each other, and everyone made fast friends and made the most out of every situation. Their enthusiasm and hard work made it a week to remember! Our sincere appreciation is extended to the members of the Utah Valley and Salt Lake City chapters who volunteered their time and efforts to make the 2016 Utah POE a resounding success. Please contact us at: gro.o1556214243gavu@1556214243ofni1556214243. We will be happy to assist you.